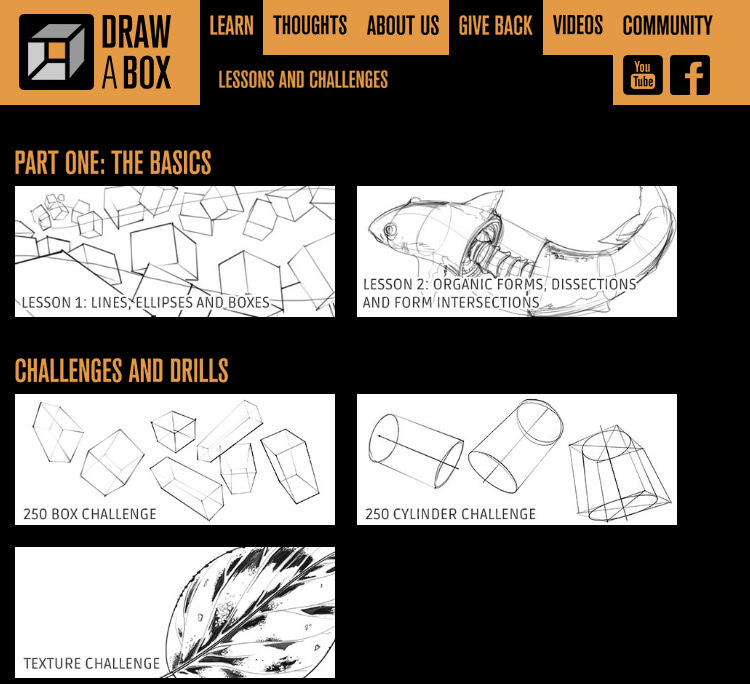 Beginning artists should know about the free learning resource Drawabox.com. It’s a completely free course made by the Redditor /u/Uncomfortable in his spare time. This person studied art at the Concept Design Academy in Pasadena, CA. He has years of practice as an artist primarily with constructionist techniques. The lessons follow how to draw objects based on simple 3D forms like spheres, cubes and cylinders. Many people argue about the importance of fundamentals. You really can’t be a great concept artist without first mastering the fundamentals like perspective, value, lighting and basic linework. 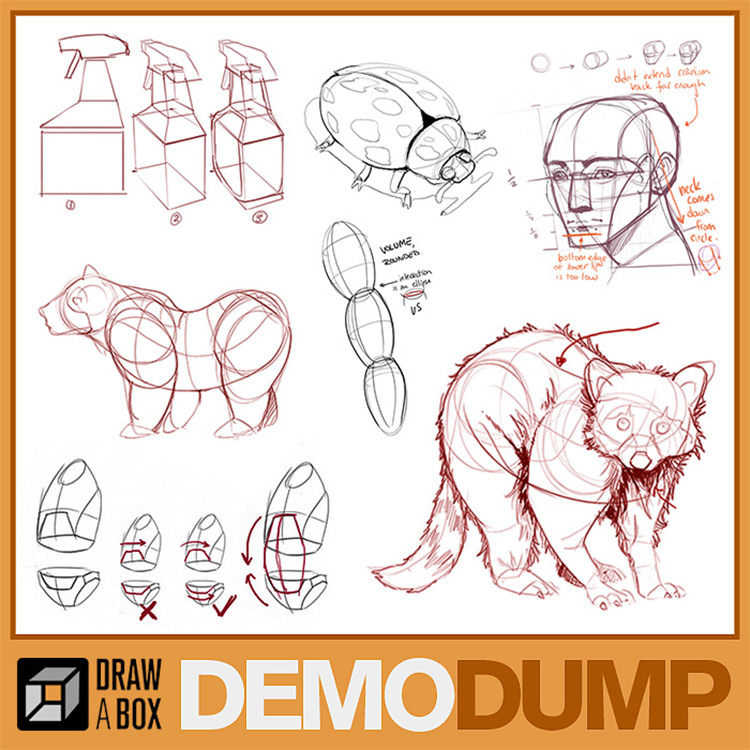 Draw A Box focuses directly on these fundamentals with lessons learned from the CDA instructor Peter Han. Peter is even releasing a new book with many of the same lessons and notes from his CDA course. So is it worth the effort following Draw A Box lessons? Will a complete novice actually get anything from the exercises? 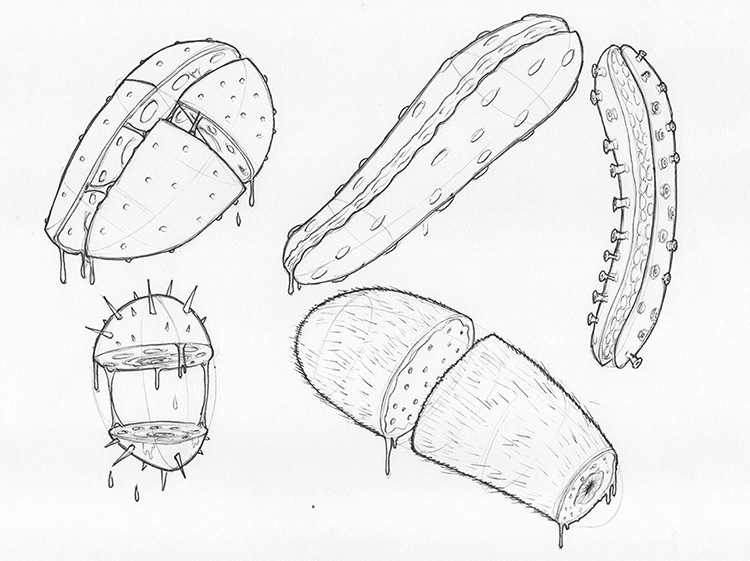 And is there enough information for a beginner to drastically improve and eventually move into concept art? I’ll offer my opinion and overview of what the lessons offer. The best thing I can say upfront is that Drawabox is completely free, and with that in mind it very well may be the best way to learn without spending any money. The actual fundamentals can be somewhat fluid because what one person considers a fundamental subject, another may consider ancillary to the fundamentals. However I don’t want to make this philosophical so let’s try to define these fundamentals. They’re the bare-bones skills that will be applied to every single piece of artwork you create. These are the prerequisite skills you want to work on to call yourself an accomplished artist. Drawabox focuses directly on improving these skills and doesn’t wander too far into any other subject matter. Here’s a quick list of the fundamentals you’ll practice by following the Drawabox lessons. Artists may argue that other subject belong in this list like color, proportions, and human anatomy. All of those topics are crucially important, especially for concept art. But Drawabox starts you with the basics of seeing things properly. You have to be able to look at an object and see it properly before you can draw it in perspective with the proper values and proportions. As you can already tell, these fundamentals are somewhat wishy-washy. How do you know when you finally know “enough” to understand fundamental perspective? The answer would likely be “whenever you can draw perspective properly”, but that’s not very satisfying. This is why I hate generic advice to just learn the fundamentals and move on. Yes it’s accurate advice. But a beginner will have no idea what this means, where to start, or where it should end up. Drawabox takes care of this for you and guides you into all of these areas one step at a time. This is perhaps the course’s greatest asset: it’ll teach you everything you need to know, even if you’re not sure what that is! Everything in art relates to seeing properly and executing properly. These practice lessons aim to train the same skills that every artist has acquired through ferocious repetition. The Drawabox instructor is very clear that drawing is not a magical skill for some but not others. Every human can learn to draw with practice. But it needs to be the right kind of practice to actually see progress. That was the whole point of creating Drawabox. It started as a free subreddit but quickly grew large enough to warrant its own website. Lessons break down into challenges with practice work and homework. The very first lesson teaches basic shapes with lines, cylinders, and boxes. These fundamental shapes can be used to construct everything you see around you. Other more detailed lessons explain these concepts further by teaching from example. 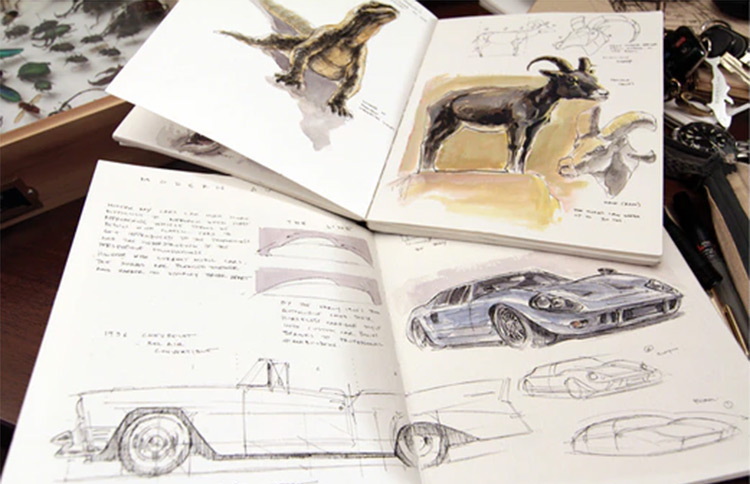 You’ll follow more generic lessons that teach how to draw plants, insects, animals, objects and vehicles. These lessons may seem bland but they’re perfect for beating the core fundamentals into your brain. It’s not just about your capability to draw boxes, but also about your ability to see organic shapes in anything you look at. I will say that it feels the lessons jump in difficulty very quickly. By the 3rd or 4th lesson some beginners may feel overwhelmed or defeated because of their inability to draw properly. But if you follow exactly what’s written in the lesson plan and keep practicing you will get better. If you struggle with a particular lesson just keep doing it every day. Do not move onto the next lesson until you’re truly confident with your abilities. Understanding how to see and how to construct what you see is the true benefit of following the Drawabox lessons. The fact that they’re free and available from any computer just makes the practice time so much easier. Artists may question how far these Drawabox courses can take you. Will they make you a professional concept artist? No. Not even close. But they will take you from a complete novice to someone who can actually be proud of their artwork. You’ll learn the foundational methods of how to see, how to copy, and how to construct objects from imaginary shapes. The lessons do not go into detail about color which is huge in concept art. And the anatomy information isn’t enough to make you a pro. Once you reach the stage of studying anatomy I’d recommend picking up a full art anatomy book. There’s also the Proko anatomy series if you’re a visual learner. Drawabox should be considered the true beginner’s resource. It will get you started thinking like an artist and looking at things in the right way. But it will not bring you all the way to a professional level. If you’re a complete beginner this is still absolutely worth the time. It’s completely free and teaches you core concepts that you’ll need to learn eventually. Plus the instructor will critique your work for free which is an incredible courtesy to beginners. Once you reach a point where you’re itching for more complex projects then take a look elsewhere. But come back to these Drawabox lessons every so often to sharpen your skills and reaffirm your understanding of the material. 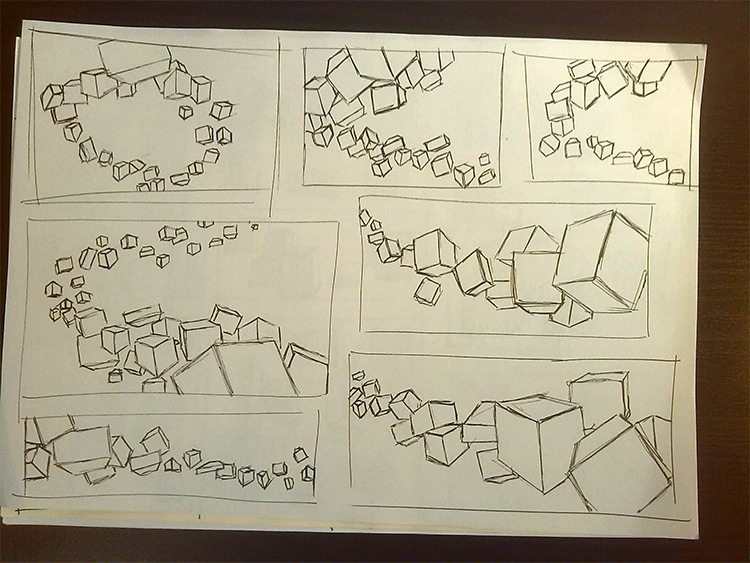 The biggest downside with Draw A Box is the inability to watch the drawing process. Many online videos on YouTube show you how to draw with a step-by-step approach. This is also true of the incredible Proko Figure Drawing Fundamentals video series. However you do get personal critiques from the Drawabox creator for free. This is incredibly nice and must take a lot of time for one person to critique all that artwork. 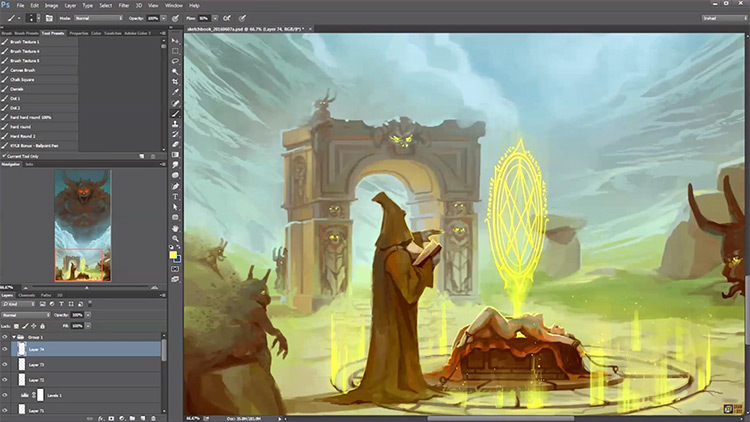 But if you’re looking for related video content there is a free Drawabox YouTube channel with a few video tutorials, walkthroughs, and painting demos. In the end Drawabox is a sweet deal. Is there much to complain about with this site? It’s completely free and offers genuinely valuable tips for aspiring artists. Not just tips, but actionable steps you can follow and repeat to dramatically improve your ability as an artist. All-in-all I would definitely recommend Drawabox for beginners. Intermediate-level artists may even learn something from the advanced lessons on composition and environment design. The key with practicing art is to follow through and stick with it. You’ll really want to draw every single day and put these Drawabox lessons somewhere on your to-do list. If you can do that then I promise these lessons will be worth the effort. 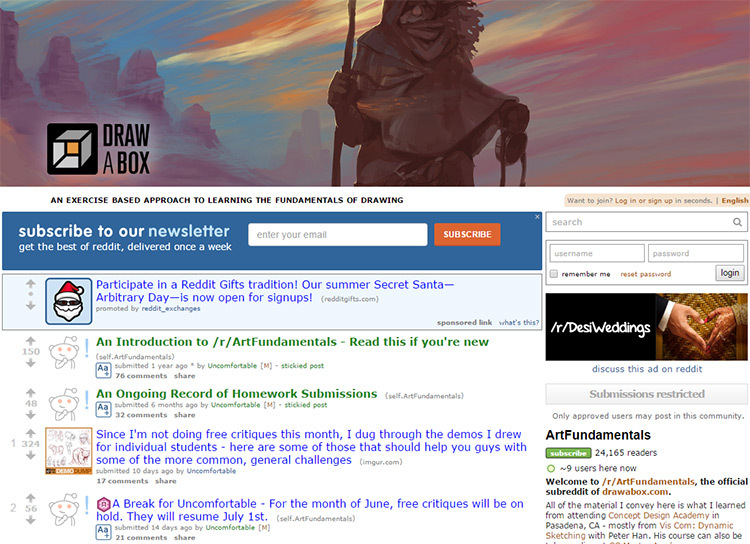 When it comes to completely free art education Drawabox and the related /r/ArtFundamentals subreddit have everything you’ll need to start down the prosperous path as a skilled artist.